Lying down above Crater Lake, I am wishing that time would stand still. Of course it’s a forlorn hope. Bushwalking might have some ability to bend the fundamental laws of time and space, but in the end even the bushwalker must admit to being just another member of the human race. I’ve been reminded of this all day by the clicking of my left knee, ticking with every stride like a bone clock*. It doesn’t hurt, but it’s a little disconcerting, not only because it tells me all isn’t well with that part of me, but also because it’s a reminder of my mortality per se. 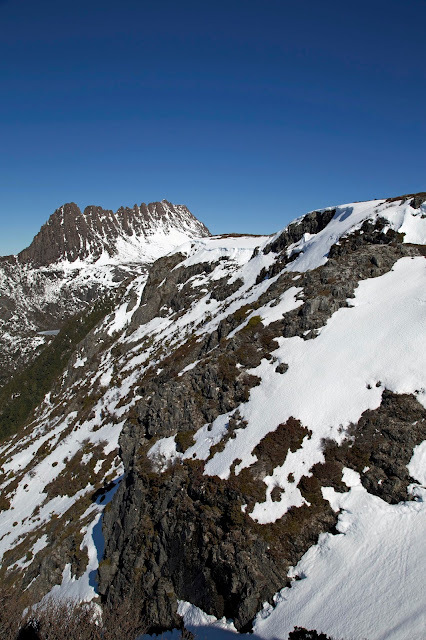 In this mood, I have the sudden desire to prolong my exposure to the plateau’s white wonders; to turn around and go further into the mountains; even to walk the whole 65km Overland Track. 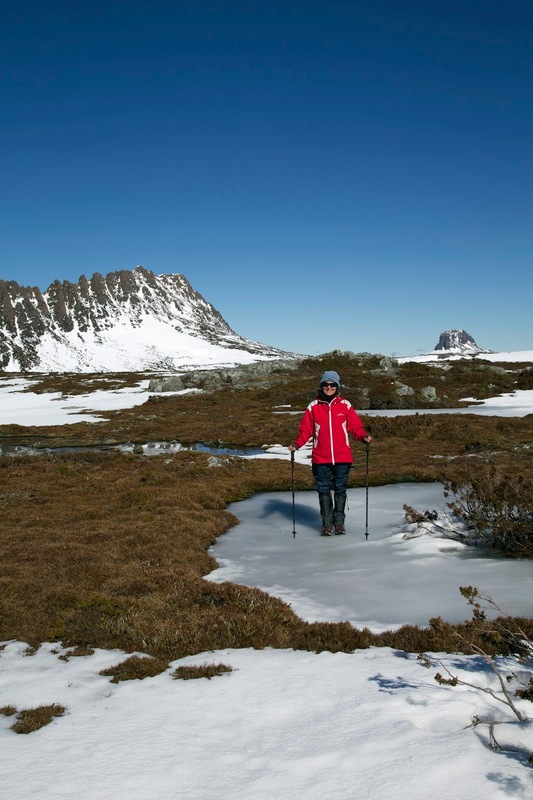 But winter days are short, and nights at 1400m in snow, without a tent and food and a sleeping bag, are not advisable. A keenness to prolong my mortal life wins out. To break the spell I simply stand up, and suggest it’s time we headed down. Yet even then we make as if we’re just wandering over to Marions Lookout; simply taking a few more photos; only moseying down a little to “see what we can see”, even though we all know we’re on our way back to the hut. Fortunately the steepness of the descent focusses the mind, and the stunning views of Crater Lake keep the beauty levels topped up. Still, we’re back on the “main drag” now. 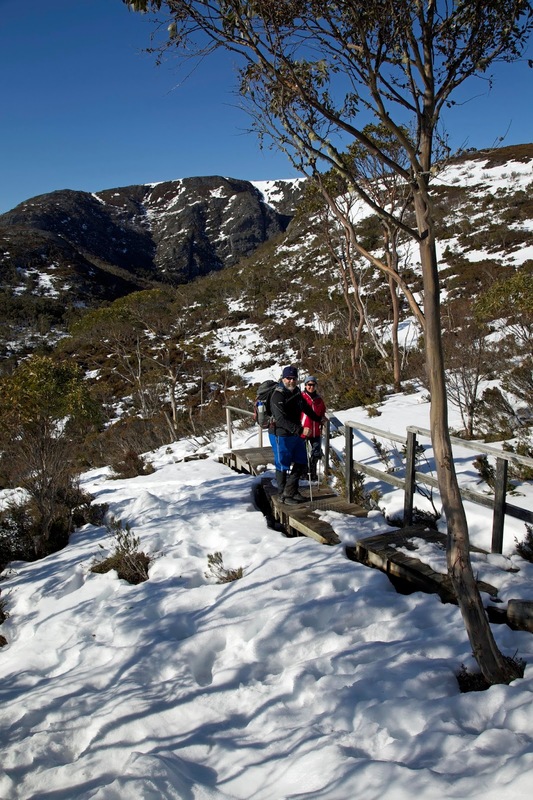 It’s both part of the Overland Track, and one of the key day walks for short-term visitors. We start meeting other walkers for the first time all day, and the contrast is jarring. Some are dressed for a stroll through an urban picnic ground. One young woman is crunching through snow in high heels, with matching fashion dress and hand bag. More sensibly, one of her companions is wearing a day-pack. But as he approaches we hear loud music coming from a device hidden in the pack. Yes, we’re undoubtedly in the transition zone between the wild and the tamed. But we’re in the mood to keep celebrating the wild. We slide and shoe-ski down some of the snowier sections, sharing a laugh with groups struggling their slippery way up the same icy sections. We keep up the celebratory mood back in the hut, with shared food and wine, and animated discussion about everything from pilgrimages to cuisine. And when Tim reads us some of Michael Ende’s rather chilling novel “Momo”, we exchange thoughts on how we use time. We wonder at the metaphors we use, such as spending time and saving time. People are persuaded to save time by eliminating everything not useful. One of the people … cuts out his girlfriend, sells his pet, stops singing, reading and visiting friends. In this way he will supposedly become an efficient man getting something out of life. What is strange is that he is in a greater hurry than ever. The saved-up time disappears - and he never sees it again. We drift off to sleep with deep timey-wimey thoughts going through our minds. And in the morning, it seems we’re unhurried as we prepare to go our separate ways. 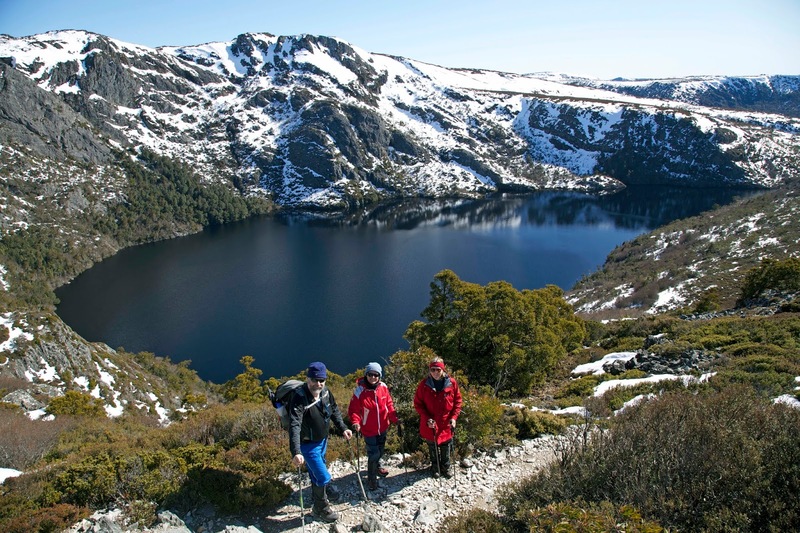 Tim and Merran have more time to spend on the plateau, while Lynne and I will have some time with our daughter and family in Launceston. Whatever we’re planning, our stay at Cradle has been a good reminder that hurrying won’t slow the passage of time. Yet somehow being deliberate, being present to others and to the moments we share with them, noticing and celebrating wonder, opening ourselves to silliness and the wasting of time: those ARE things that seem capable of changing the flow of time. * The title of David Mitchell’s 2014 novel “The Bone Clocks”, derives from the contemptuous name given to mere mortals by some of the book’s immortal characters.